From bestselling, Printz Award-winning author Libba Bray, the story of a plane of beauty pageant contestants that crashes on a desert island. Teen beauty queens. A "Lost"-like island. Mysteries and dangers. No access to emall. And the spirit of fierce, feral competition that lives underground in girls, a savage brutality that can only be revealed by a journey into the heart of non-exfoliated darkness. Oh, the horror, the horror! Only funnier. With evening gowns. And a body count. I feel like my thoughts on feminism are perfectly summed up in Beauty Queens by Libba Bray. Now I won’t have to explain my views, but just hand people Libba Bray’s book instead. 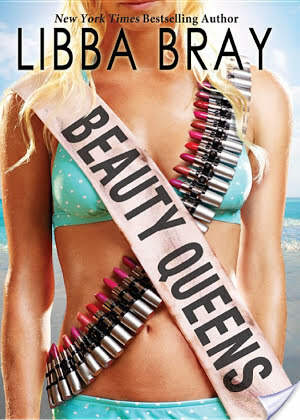 Beauty Queens by Libba Bray begins with a word from our sponsors, The Corporation, warning that some things may be subversive. In this Lord Of The Flies meets Miss America-esque novel, an airplane carrying 50 contestants in the Miss Teen Dream pageant crashes on a deserted island. Not everyone survives the crash. Those living are left to navigate the wild jungle wilderness with grace and poise. Sprinkled throughout the novel are fact sheets on each of the living contestants, adding background and interest. Plus I love numbered things, therefore loved those sections. I feel like a broken record, but I loved Beauty Queens! From alpha girl Taylor Krystal Rene Hawkins who is the ultimate contestant to Petra with an interesting secret to Adina who wants to blow the lid off the operation to Jennifer who loves comics, the cast of characters is dynamite and layered. I loved that the main players had secrets and were diverse in ethnicity and sexual orientation. I loved that the characters were more than just a foible for a hot boy to show up. Instead, I though they were a great means to explore different issues within our society. Beauty Queens contains satire that I could actually understand. I mean, I’ve been assigned reading that is ‘satire’ and I usually wind up not getting it. Although, I guess that says more about me than anything else. Anyhoo, Bray takes a hilarious look at our consumer culture. For example, there’s lady stache ‘off, a product continually mentioned that will get rid of your facial hair AND clear up your skin, oh and it also works as napalm in a pinch. There’s a lot of commercial products in this book that are lampooned. I loved it. I also loved that Libba Bray took on my favorite guilty pleasure, reality TV. There’s one in there that totally appealed to me, about Revolutionary Babes or something, pretty much features oversexualized women of the revolutionary era. Hilarious. Besides this, race and class and sexism also are huge themes in this book. For example, the process of relegating women of color to sassy sidekick roles on tv is called out. There’s also a part where they mention how girls have to spend all this time on their appearance, but guys just have to put on clean clothes and they get all this praise. I love that. I can remember long discussions in women’s studies on these topics, so of course these themes appeal to my inner feminist. I honestly hope that in the future teens will be discussing Beauty Queens in their book clubs or classrooms. There’s so much food for thought in this awesome read, that I think I could go on discussing it for days and days. Disclosure: Received for review via Amazon Vine. I got this book from the library this week and I am seriously looking forward to reading it. It sounds hilarious and I can’t wait to get started! Awesome review as always! I’ve seen this book around and I’m intrigued. It looks really interesting. Thank you for review. I like that the book has many themes to it. I’ve not read any books by Libba Bray before. I think this book would be a great introduction to her work. I have to admit that just by glancing at the cover, I was going to stay away from this book because it looked… well, it looks kind of dumb. But never judge a book by it’s cover, right? Your review totally makes me want to read this. It sounds a little bit like Battle Royale, in which kids are thrown on an island and have to kill each other off until there’s only one left. This of course doesn’t sound nearly as dark. The whole reality-tv aspect of it kind of reminds of me of The Hunger Games though. Great review for a great book! I’ve never been great with satire but Libba Bray nailed it in this one. I’m with you — I hope BEAUTY QUEENS comes to a classroom near us soon. So much good, juicy stuff to read and discuss in there! I have to admit when I checked out this book I was looking for something stupid and silly to read. But insead I laughed so hard I fell out of my bed at one point. Beauty Queens was funny, different, and explored topics often left silent. I will be purchasing this book A.S.A.P. I simply loved it. The author Libbia Bray has a great sence of humor and was full of jokes. This was very different then what I was expecting, including some explosive fun. I have this, and I was a little wary of it, but seeing that you loved it means I much give it a chance! Lori recently posted..Ruby Red Giveaway! I really liked the different personalities of each of the contestants, especially Adina. Glad to hear you liked it! I’ve been itching to get my hands on a copy of this one for a while now! 🙂 I love Libba’s writing & I’ve been excited for this one for a long, long, long time! Your review makes me really excited to see how it all comes together! I’m 42 and am LOVING this book (almost finished!). I’ve recommended it to males and females, young and old. Libba Bray has cleverly written a feminist tome in the disguise of a “silly” book about teenage beauty pageant contestants. I’m already casting, the movie, too! Emma Stone as Adina, Blake Lively as Taylor, Zoe Saldana as Nicole, Ellen Page as Jennifer, Ken Jeong as Momo B. ChaCha, Jonah Hill as Harris,..